The 4th edition of Experience Music builds listening skills that extend beyond the classroom with McGraw-Hill’s Connect. Connect includes new mobile listening guides that deliver powerful interactive music selections to students on-the-go. The varied experience that each student brings to the Music Appreciation course is now fostered through McGraw-Hill’s LearnSmart® and Spotify® integration, to personalize learning the language of music and the art of listening. Experience Music On The Go - All of the audio selections addressed in Experience Music's Featured Listenings and Listening Guides are available in McGraw-Hill Education's Connect Music via simple streaming player and through newly re-designed interactive listening guides - now optimized for tablets and smartphones. Through Connect Music's Interactive Listening Guides, instructors can monitor whether individual students have completed the listening, as well as assign points for listening. Experience Personalized Playlists - Recognizing musical elements in a piece you have never heard before is a learned skill. To help learn this skill, McGraw-Hill Education partnered with Spotify®, the service that allows you to build playlists and stream music for free. Look for the Spotify playlists integrated into the McGraw-Hill Education Connect Music eBook, or the Spotify marginal icons in the print edition. These will lead you to playlists that correspond to concepts covered in Experience Music. Through the Spotify playlists, you can access examples of specific musical elements in songs that are already familiar to you. Experience Personalized Learning - McGraw-Hill Education's Connect Music is now fueled by LearnSmart, an adaptive learning program designed to personalize the learning experience. LearnSmart is proven to help students learn faster, study smarter, and retain more knowledge for greater success. By helping students master core concepts at their own pace, LearnSmart enables instructors to spend more meaningful time in the classroom. Experience Personalized Grading - The first and only analytics tool of its kind, McGraw-Hill Education's Connect Insight is a series of visual data displays, each framed by an intuitive question, providing at-a-glance information on your class. Intuitive - Receive an instant, at-a-glance view of student performance matched with student activity. Dynamic - Connect Insight puts real-time analytics in your hands, so you can take action early and keep struggling students from falling behind. Mobile - Connect Insight travels from office to classroom, available on demand wherever and whenever it’s needed. Create a Unique Music Experience - Through McGraw-Hill Create, a newly revised Rock Music chapter is available for instructors who want more focus on this genre—Katherine Charlton’s area of expertise. Additionally, Create-only concert reports are available by genre for instructors who want to include worksheets that guide students through this popular course exercise. McGraw-Hill Create allows you to build a unique print or eBook tailored to your course and syllabus. For more information, visit http://create.mheducation.com. 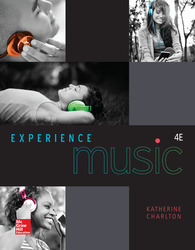 McGraw-Hill Education's Connect Music is the most successful digital solution for the Music Appreciation course and continues to power the 4th Edition of this text. Connect Music delivers a truly integrated teaching and learning program that provides both one-click access to the program’s music selections and interactive exercises that focus on the listening process. A three-part listening framework, Katherine Charlton's hallmark approach to developing critical listening skills, begins with a First Hearing to open each chapter. The Featured Listening then provides a step-by-step listening guide that returns students to the work heard in the First Hearing and trains them to discern the meaningful elements, theme, and instrumentation of the selection. Finally, each chapter ends with a Finale. Students are asked to use knowledge acquired in the chapter to respond to more advanced questions about the piece encountered in the First Hearing and Featured Listening. Having studied the piece throughout the chapter, students will see how much more they are able to hear in the same piece of music. The “MusiCurious” feature, presented in a Q&A format throughout the chapters, addresses common student questions that were collected by the author over the course of her teaching career. MusiCurious: What Does the Conductor Do? MusicCurious: How Does a Composer Write a Piece of Music? MusiCurious: Does the Listener need to know the Program in Program Music? MusiCurious: How is it Great Art if it is Ugly? Katherine Charlton Calkins teaches in the music department at Mt. San Antonio College where she spent eight years on the all-college general education committee and then served as chair of the music department for the following ten years. During a yearlong sabbatical in 2007-2008 she studied women composers and compiled biographies, recordings, and listening guides, which she made available to her colleagues to help them add more women to their music appreciation and history classes. As a performer, she has a degree in classical guitar from California State University at Fullerton. She toured in Southern France and Tuscany, playing lute with an early music group led by her late, first husband Andrew Charlton and his friend Gloria Ramsey, both well known in the field of early music. Calkins also played percussion and toured in Japan with the CSUF Wind Ensemble. She got her M.A. in music history and has continued with further graduate study in that same field. As a teacher, she started the guitar program at Mt. San Antonio College, where she continues to teach music history, music appreciation, and history of rock music. Her first book, Rock Music Styles: A History, is now out in its sixth edition, published by McGraw-Hill Higher Education. Experience Music is her second book.